I have been luckily enough to be featured in some fabulous publications, both regionally and nationally. 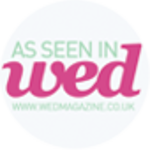 I have been featured in the national 'Wedding Ideas Magazine', regularly in the Devon WED Magazineand one of my couple won the 'You and Your Devon & Cornwall Magazine' Wedding of The Year competition! Digital versions (where available) are listed with the link below. Happy reading!